These parties are available on Sundays or after usual opening hours. We require a minimum of 12 children, to a maximum of 20 children. ﻿﻿We offer a special range of pottery to choose from and provide all the decorative materials for the children to complete their masterpiece. Our friendly staff will provide you and your guests with instruction to help you get started. 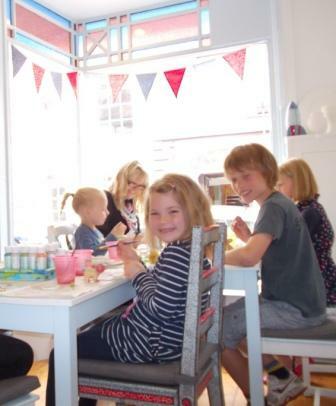 A Party Package also includes the glazing and firing of your painted pottery, party invites and squash for the children. Please call for details regarding after hours parties. We offer an optional party menu, which includes a selection of freshly prepared sandwiches and snacks. A yummy cake can also be provided - please ask for price. Food must be ordered when booking.